Incendiary kites, balloons, cause 24 fires in one day, Palestinian Authority claims youth injured in Gaza explosion. 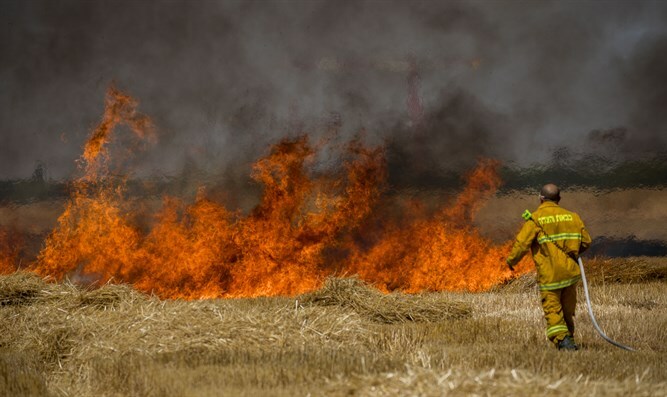 Firefighters on Saturday worked to extinguish 24 fires which broke out in Gaza border towns due to incendiary kites and balloons sent into Israeli territory by Gazan arson terrorists. All of the fires are now under control. The kites and balloons sent into Israel are armed with firebombs and other explosives. Some of them have landed in private homesand near kindergartens and playgrounds, and others have sparked fires in populated areas.Most of the incendiary kites and balloons have caused agricultural damage, scorching fields of wheat and produce. As of the beginning of June, the arson terror had caused 5 million NIS ($1.4 million) in damage, and scorched over 5,000 dunam (1,235 acres) of land. On Friday, Gazans brought down an Israeli drone. According to the IDF “there is no concern” that the incident will compromise sensitive information. In addition, two Gazans participating in the violent “March of Return” riots were killed. On Saturday, the Palestinian Authority’s (PA) “Health Department” claimed that two 17-year-olds were killed and eight people injured in an explosion in northern Gaza. Three of the victims, it said, were severely injured.